Speedy the cheeky house bunny: Speedy gets a new Award! Yesterday was Independence day in the USA and I had a party to celebrate with you all,but to my surprise I received an award too!From my Friend Katie at Katie and Glogirly they gave me the One Illuminating Blog award So I have to say a big thank you to Katie and Glogirly....THANK YOU! Katie from Katie and Glogirly! So I now need to give you another 7 interesting facts about my self and nominate some more deserving blog too! this is so exciting!....heeheehee. 1:I love having a cuddle on mum and dad's bed with my head buried under mums Popple(its a special cuddly toy). 2:My favourite treats are Raisins,Cranberry's and of course peanuts! 3:I have a little cuddly rabbit that I use as a pillow. 4:I have glaucoma in my left eye which is hereditary in white bunnies. 5:I was rescued at an animal auction by a nice man who brought me and lots of other bunnies to save us from going to the snake man or for pet food and was re homed with my mum and dad. 6:I love to help my mum with the gardening. 7:I don't normally like going to the vets but its ok if mum holds me. Ok this is the best bit because now I get to nominate those deserving blogs for this award too!Trumpets Please! 8:Zantippy and Friends:Poetry by the Iguana,and other Fables of the Galaxy. Congratulations to you all!Lets have another Party...heehee...if mum lets me...heehee! 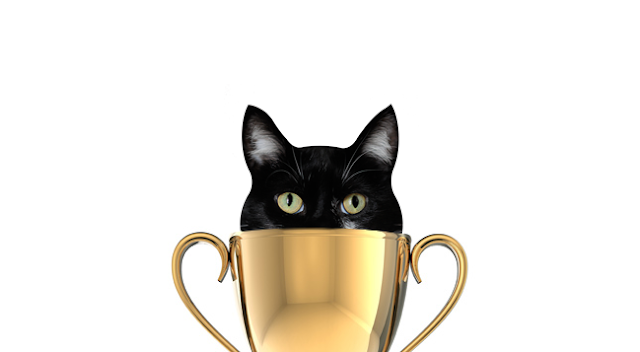 You are racking up an impressive number of awards, Speedy--congratulations! For he's a jolly good bunny, for he's a jolly good bunny, for he's a jolly goooood buuuuuuu uhhhhhhhh neeeeeeeeee that nobody can deny!!!!! Gimme and ES, Gimme a PEE, Gimme a double EEEEEE, Gimme a DEE, Gimmy a Y!!! What does that spell? SPEEDY SPEEDY SPEEDY!!!! congrats on your award and we love the graphic that Katie did for you! Rabbits eat peanuts? I never knew! Those are wonderful answers, Speedy!!! Hey I was just over at Beaded Tail's blog and it's all about BUNNIES! You should check it out. 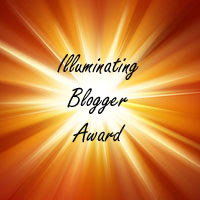 Thanks yous for giving mes the illuminating blogger award! Me always appreciates getting awards especially when they is form such wonderful peoples like yous guys! My hairy slobbery sister Bob says she has not met another animal with glaucoma (except at the eye doctor's) and she is so happy that taking her eye out made the headaches goes away. we was happy to reads that they does not bother bunnies like dogs.